This week’s topic: What is your favorite line from your WIP (or from a book you read recently)? Oh, how to choose? 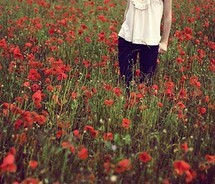 I have lots of favorite lines from the WIP I’m currently querying, Where Poppies Bloom. Wait–is that egotistical? I mean, I have to love the lines in my WIP, otherwise I’d delete them and try again (and again and again), right? First, here’s a little summary: Drowning in guilt that stems from her younger sister’s tragic death, seventeen-year-old Callie Ryan travels to the Oregon coast to spend the summer with her aunt. Cheerful yard boy, Tucker Morgan, manages to resurrect a glimmer of the girl Callie used to be, but she also finds unlikely companionship in mysterious Nathan Stewart, the dark and ethereal ghost bound to her aunt’s house. When Callie discovers a chilling, decades-old connection between Tucker and Nathan, she must choose between life with the golden boy who dulls her pain, and eternal escape with the ghost who may harbor sinister motivations. There is one thing I’m sure of, and it’s dreadfully selfish: I want Tucker to kiss me. The spark of life I normally feel in his presence was multiplied by a thousand with his innocent kiss on the beach earlier. I can’t stop wondering what it would feel like if we really kissed. If I’d spontaneously combust with the emotional high of it all. There’s no denying that. I nod, reveling in the sensation of his finger tracing the lines of my face. The slope of my nose, the bow of my upper lip, the curve of my cheek. I watch his eyes as they follow the path of his finger, his expression adoring. “Tell me you feel it too,” he whispers. It’s something like sinking, being sucked into a black hole of misery and guilt, only I’m not alone. I have a companion in Nathan. When his dark, sad eyes meet mine, it’s as if we’re inexplicably linked. Nobody can break that bond. Nobody but Tucker, who is Nathan’s direct opposite. If Nathan is a black hole, Tucker is the brightest of stars, twinkling incessantly, leading me home. What about you? Any favorite lines from your WIP? Your favorite books? ooooooooh. These are great. I’m getting chills. I love your premise, and it looks like the execution is ALL there. This is great. I’m really intrigued by your blurb and what you’ve shared. I love this book more and more by the day. Cannot wait to hear how it’s received!! Hopefully well! 🙂 And thanks for commenting, Heather. Your stamp of approval means the world to me! How romantic! I love the black hole/star contrast between your two characters. So intriguing. they’re all lovely, but the last bit intrigued me the most. very curious about the dynamic among these three characters! Very interesting! The first part almost reminds me of CITY OF ANGELS, where she can see him only when he wants her to (or am I confusing COA with some other angel movie, lol?). Ooh, I’ve never seen City of Angels, but now I kind of want to check it out. Thanks, Abby! I could very much see myself getting sucked into this – love the mysterious romance! Great sounding premise and the lines really drew me in! Thanks so much for the kind words, everyone. This is such a fun Road Trip–so much fun to read everyones amazing favorite lines! I seriously cannot pick a favorite out of the lines you shared–they are all so beautiful! You do an excellent job with evoking romantic emotions. Love! “If Nathan is a black hole, Tucker is the brightest of stars, twinkling incessantly, leading me home.” What a great visual for their comparison, and I love the connotations of the pull and emptiness of the black hole versus the brilliant guiding star. I can see why it was a favourite line!